Essential Themes - HISTORY'S HISTORIESYou are history. We are the future. In 6th grade History class this year you will study ancient civilizations. 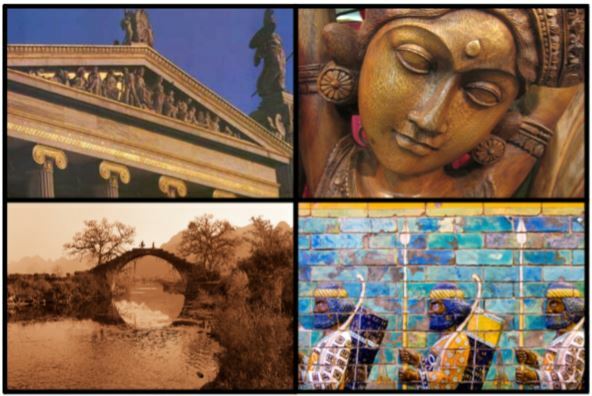 In order to help you identify patterns and highlight similarities and differences in the civilizations we study, I want you to keep a few important themes in mind. How does understanding the past help us to understand the present? People choose to move and settle down for very specific reasons. Scientists refer to this movement as "human migration." Reasons to migrate include natural and human resources and/ or a need for security. Geography, the study of how humans interact with their environment, helps explain why humans move and live where they do. People behave the way they do because of their belief systems. Belief systems help guide ideas about right and wrong. That was as true in the ancient world as it is today. When thinking about this question, consider the roles that education, religion, philosophy, and cultural traditions, play in shaping human behavior. When populations grow, organization becomes a necessity. Government grows out of this need for organization. Traditional roles for government include the establishment and enforcement of laws and the distribution of resources. 4. Technology: How does technology affect people's lives? Technology is a tool that makes a job easier. For pre-historic populations, technology might have been a simple stone that made cracking open an oyster shell a simple task. Technology, or tools, make people more productive. When answering this question, think about the ways that new technology gets introduced into a culture, and think about what results when innovations are put to use. There is a saying that there will always be wars and rumors of war. When examining this question, think about the reasons people go to war. What sort of differences drive people to that extreme measure. Also, think about the reasons that people might cooperate to achieve common goals in a conflict. Lastly, think about the outcomes of war, both peaceful (treaties) and not so peaceful (the confiscation of rights and freedom). 6. Economics: How has the quest for resources and trade shaped human history? The study of how humans create, consume, and exchange (trade) wealth is called economics. Today, people and societies trade or exchange an amount of money for resources. When you go to the candy store you give the clerk cash for your Skittles. In the ancient world, people often traded resources that they had (say, things like grain) for things they needed (perhaps, wool or metals). It's true, too, that they often fought one another for those resources, just as societies do today. History is more than just "what happens." Unfortunately, a lot happens that we never hear about. Because of that shortcoming, "history" is defined by what is recorded. Throughout history, humans have left evidence of their culture and their activities in their art and in their written records. Sometimes, however, the records of human activity come to us in the form of fossils and artifacts. When that is the case, it's the job of people working in the social sciences (archaeologists and anthropologists, primarily) to interpret history and tell the story of the past.